Inside the food court at Industry City in Sunset Park you will find a meat lover's paradise. Ends Meat is half sandwich shop, half meat market or as they like to call themselves, a "whole animal salumeria." John Ratcliff is the head butcher and meat expert. On the day we visited, sandwiches like"The Hogfather" were being offered. It's made with pancetta, finocchiona salami, provolone and greens. Beef meatballs with provolone, a chicken Caesar with bacon, and muffuletta, an Italian sandwich made with mortadella, soppressata, olives, pickles and parsley oil, were also on the menu. All of which were price at $10 or under. You can also make your own sandwich with your choice of cured meats, breads and spreads. 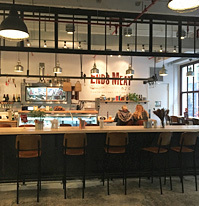 Ends Meat is also catering, from salumi platters to a whole hog roast serving up to 150 people. The shop uses meats from from local farms in New York and New Jersey that are free of hormones or antibiotics. UPDATE: Ends Meat now has a counter where diners can eat in. One of the specials we tried is Pigstrami, which in our humble opinion, is one of the best sandwiches we've tried in Brooklyn. Thin slices of juicy pork topped with pickled mustard seeds, pickled cucumber, white onions, mayo and cheddar on a crispy baguette. It's delicious!